When the Winter Jam Tour Spectacular blew into Atlanta, Georgia on Feb. 6th, home to many of the artists, the Georgia Dome transformed into a place where everybody was somebody. Everybody anxiously waited in long, twisting lines to see their favorite Christian artists; everybody was ready to get their socks rocked at the nation’s largest Christian music tour – but most importantly, everybody was somebody Jesus loved and gave his life for. And that’s been the mission and ministry of Winter Jam since its inception in 1995 – to win souls for Jesus Christ through the good news of the gospel in song. Co-headlining the 2016 tour includes Grammy®-award winning Australian duo for King & Country, and four-time Grammy®-nominee singer/songwriter Matthew West. The exciting artist line-up included heavy hitters in contemporary Christian music such as Crowder, Lauren Daigle, RED, We Are Messengers, Stars Go Dim, and Sidewalk Prophets, with Reach Records’ own KB, Tedashii, and Trip Lee bringing the Christian Rap/Hip-Hop flavor to the tour. This was no modest lineup for the modest $10 donation at the door (no tickets required). “The idea from the beginning was to make it so that everybody can come, and God has honored that” said Eddie Carswell, creator of Winter Jam and founding member of the Christian music group NewSong, during our pre- Winter Jam Atlanta interview. The uplifting evening brought in over 40,000 guests to the Georgia Dome, including churches and youth groups from all over the country. 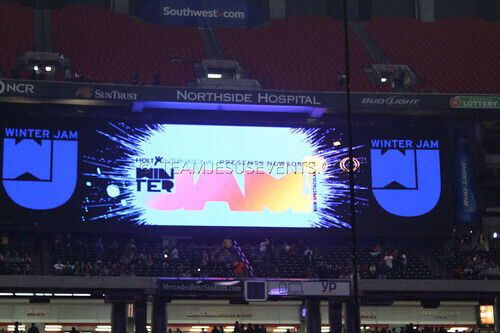 Atlanta was the 20th stop this year as the 2016 Winter Jam Tour makes its way to 48 markets, including some of the largest venues typically reserved for pop icons such as Beyonce’ or Justin Bieber. The myth that only music superstars can pack the country’s largest arenas was debunked by Winter Jam in 2011, when the tour was ranked the #1 tour in the world, outranking the likes of Bon Jovi, U2, Lady Gaga, Brad Paisley and Justin Bieber, according to Pollstar’s 2011 Worldwide First Quarter Ticket Sales “Top 100 Tours” chart. In addition to moving performances by the main artist lineup, the evening included special highlights and surprises: a soul-stirring rendition of “Georgia (Jesus) On My Mind” by American Idol’s 2015 Runner-up, Clark Beckham; RED’s infamous masks and pyrotechnics-laced show; the moving testimony of survival and God’s providence by Stephanie Fast, author and orphan/adoption advocate for Winter Jam sponsor Holt International; Matthew West invites a 12-year-old attendee on stage to sing with him – greatest moment of his young life! The night would not have been complete without sharing the Word of God, and author, soul-reaper, and Evangelist Tony Nolan did just that. Sharing from Romans 5:8, Pastor Nolan reminded the crowd that when it gets hard to see God’s love for us, all we have to do is look to the cross where God’s love was demonstrated in the death of his Son, Jesus. The invitation to accept Jesus Christ was received by thousands, and included a follow-up plan to seal and encourage their new journey with Christ. Team Jesus Mag publisher, Kim Brightness, with new Winter Jam friends. We may have gathered as strangers from different cities, as people from different cultures and backgrounds, but everybody united under the banner of God’s love, and in celebration of our Lord and Savior Jesus Christ. We ask the body of Christ to continue to keep Winter Jam Tour Spectacular and other Christian tours/events covered in prayer for more souls won for Jesus, safety, and God’s continued blessings on the artists, tour staff, and the families who share their loved ones in ministry with the masses. Winter Jam Tour Spectacular is still going on in a city near you, with its last stop in Louisville, KY on April 3rd. Visit JamTour.com for more information. In the meantime, check out our photo gallery below of some of the night’s best moments, as well as live snippets from our Periscope at Winter Jam! Previous article“What We Do Isn’t Who We Are.” – Rapper Andy Mineo to Ronda Rousey…and You!